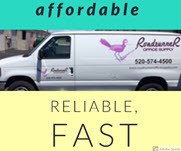 Roadrunner Office Supply, LLC is a local Tucson business owned and operated by the Gerber Family since January of 2008. After operating a similar business in the New York area for almost 15 years, Jerry Gerber decided to open Roadrunner Office Supply in his new local home town Tucson, Arizona In hopes of serving local businesses with free next day delivery. 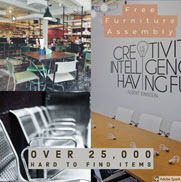 We strive to conveniently offer a wide range of products like: break room supplies, janitorial supplies, furniture, ink, toner, and difficult to find items. With over 20 years experience in the office supply industry, Roadrunner has the expertise to help customers choose the products that will best suit their needs.Roadrunner is an independent, family owned and operated local business. We specialize in meeting the office supply needs of local Tucson businesses, saving you time and money, and providing excellent customer service.